In an unexpected and unprecedented development, we have received official word today that the entire Halloween franchise of all 10 films and every alternate version of each will be released together for the first time in Halloween: The Complete Collection, a massive new 15-disc Blu-ray set coming this September! The full set of all 10 Halloween films will be released on Blu-ray on Sept. 23. You can read the full press release below, and watch site for more details and art as they become available! …and Happy Halloween! Last year, the horror classic Halloween celebrated 35 years of terror for those willing to partake in its vision of unrelenting horror. But that was only the beginning of the celebration. What producers Moustapha Akkad, Debra Hill and Irwin Yablans, writer/director John Carpenter and stars Jamie Lee Curtis & Donald Pleasence started in 1978 has transformed into one of the most durable, iconic – and copiously studied — horror film franchises ever created. Before Jason, before Freddy, and before Jigsaw, there was…Michael. 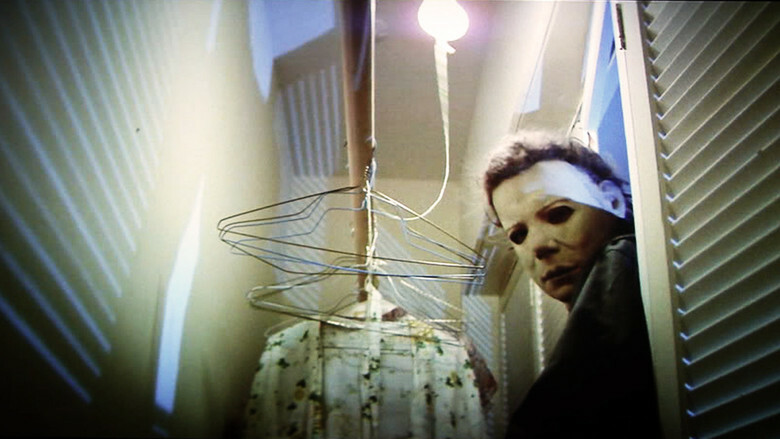 Over the years, audiences have lived and relived the terrors of Michael Myers through ten feature films, as well as various re-edits and alternate versions. Yet to date, the complete saga of Michael Myers could only be told in pieces, in individual DVD and Blu-ray™ releases, with the rights spread across multiple home entertainment studios. Through the unprecedented collaboration of rival home entertainment companies Anchor Bay Entertainment and Scream Factory – the leading purveyors in horror home entertainment –Halloween The Complete Collection Blu-ray™ box sets arrive September 23rd. For the legions of Halloween fans, the Deluxe Edition boasts 15 discs and contains all the Halloween feature films – Halloween, Halloween II, Halloween III: Season of the Witch, Halloween 4: The Return of Michael Myers, Halloween 5: The Revenge of Michael Myers, Halloween: The Curse of Michael Myers, Halloween H20, Halloween: Resurrection, Rob Zombie’s Halloween and Halloween II. The set includes the NEVER BEFORE RELEASED producers cut of Halloween: The Curse of Michael Myers as well as the ultra-rare network TV version of the original Halloween, the network TV version of Halloween II, plus the unrated versions of Rob Zombie’s Halloween and Halloween II. It is packed with hours of BRAND NEW bonus features including new interviews with cast and crew from the entire franchise! In response to years of fan feedback, the first Halloween will now also include the original mono audio track and the set will include both versions of the original Halloween-the original Blu-ray™ release and the recently remastered 35th Anniversary version with the mono track added back in! It also comes with a limited edition 40-page book written by Michael Gingold of Fangoria Magazine. The collectible packaging will include a newly commissioned illustration on the outer case and each film will be in its own black Blu-ray™ case with the original theatrical one sheet as the key art. This deluxe set carries an SRP of $169.99. The 10-disc Edition includes the original theatrical versions of the Halloween films and will include select bonus features. SRP is $129.99. Both sets pre-book August 27 and will be distributed by Anchor Bay Entertainment with bonus features developed and created by Scream Factory and Anchor Bay. Artwork and bonus features to be announced in the next couple of months. The original indie blockbuster that launched a thousand cuts…Halloween stars Jamie Lee Curtis (A Fish Called Wanda, True Lies) in her debut role. Anyone who’s ever watched a horror film in the last 35 years knows the story of Michael Myers, who as a child, butchered his sister with a kitchen knife. Committed to a mental institution and watched over by Dr. Loomis (Donald Pleasance, Halloween II, IV & V, Fantastic Voyage), he engineers his escape 15 years later, returning to his hometown of Haddonfield, Illinois on Halloween night to terrorize anyone who gets in his way, including babysitter Laurie Strode (Curtis). Co-starring P.J. Soles (Carrie, Stripes, Rock ‘n Roll High School), Kyle Richards (The Watcher in the Woods, Eaten Alive), Nancy Loomis (Carpenter’s Assault On Precinct 13, The Fog), Charles Cyphers (Escape From New York, The Fog) and Brian Andrews (The Great Santini, Three O’Clock High), Halloween also cemented the careers of many behind the camera including Carpenter, Cundey, producer Debra Hill and film editor/production designer Tommy Lee Wallace (Halloween III: Season of the Witch, It). Because Hell would not have him, Michael Myers survived the mine explosion thought to have killed him. One year later, his traumatized young niece Jamie (Danielle Harris of Halloween 4) is horrified to discover she has a telepathic bond with her evil Uncle…and that Uncle Michael is on his way back to Haddonfield. But Dr. Loomis (the late, great Donald Pleasence) has a new plan to destroy The Boogey Man in his childhood home using Jamie as bait. Tonight, the carnage begins again: Michael Myers is back with a vengeance! Ellie Cornell and Beau Starr return for this hit sequel that features grisly gore by Greg Nicotero (The Walking Dead). This smart and suspenseful thriller scares up a bone-chilling good time with original scream queen Jamie Lee Curtis (True Lies, Halloween I & II) and a hot cast of hip young stars! Now the headmistress of a private school, Laurie Strode (Curtis) is still struggling with the horrifying, 20-year-old memories of the maniacal killer Michael Myers…when he suddenly reappears with a vengeance! And this Halloween, his terror will strike a whole new generation! Laurie’s rebellious son (Josh Hartnett – The Faculty, 30 Days of Night), his girlfriend (Golden Globe Winner Michelle Williams – My Week with Marilyn), and the school security guard (LL Cool J – CBS’s NCIS Los Angeles) will become Michael’s newest victims unless Laurie can conquer her greatest fears and put evil in its place once and for all! The time has come again for you to experience the frightening fun of Halloween – the motion picture series that totally redefined terror. Original Halloween I & II alums star Jamie Lee Curtis (You Again) and director Rick Rosenthal are back and joined by Busta Rhymes and Tyra Banks in the terrifying Halloween: Resurrection, another installment in the electrifying horror film series. The reality programmers at DangerTainment (Rhymes, Banks) have selected Rudy (Sean Patrick Thomas, The Fountain), Bill (Thomas Ian Nicholas, American Pie), Jen (Battlestar Galactica’s Katee Sackhoff) and a group of thrill-seeking teenagers to spend one fun-filled night in the childhood home of serial killer Michael Meyers. But the planned live broadcast turns deadly when their evening of excitement becomes a night of horror as Michael himself decides to crash the party. What happens when one legendary horror filmmaker tackles a horror film icon? A new chapter in the legend is born! Rob Zombie (Lords of Salem, The Devil’s Rejects) reinvents the ultimate slasher classic, unleashing Michael Myers for a bloody rollercoaster of a rampage like fans have never seen. Including a retelling of the original story that unfolds at a breakneck pace, as well as a chilling new introduction that finally reveals the secrets behind Myers’ disturbing childhood, Halloween breathes new life into one of film history’s most terrifying tales. Presenting both the original theatrical version and the unrated feature with director’s commentary, thrilling bonus features including deleted scenes and an alternate ending, and an exhaustive 4 1/2 hour documentary giving a behind the scenes look at how Zombie created “the scariest Halloween to date” (Debbie Rochon, Fangoria Radio). Rob Zombie’s H2 picks up at the exact moment that 2007′s box-office smash, Halloween stopped and follows the aftermath of Michael Myers’s (Tyler Mane) murderous rampage through the eyes of heroine Laurie Strode (Scout Taylor Compton). Evil has a new destiny. Michael Myers is back in this terrifying sequel to Rob Zombie’s visionary re-imagining of Halloween which grossed almost $80 million worldwide. It is that time of year again, and Michael Myers has returned home to sleepy Haddonfield, Illinois to take care of some unfinished family business. Unleashing a trail of terror that only horror master Zombie can, Myers will stop at nothing to bring closure to the secrets of his twisted past. But the town’s got an unlikely new hero, if they can only stay alive long enough to stop the unstoppable. ← ‘Halloween 3D’ Moving Forward; Scout Taylor Compton Back as Laurie Strode? Trick or Treat Studios Reveals ‘Halloween II’ Ben Tramer Mask!